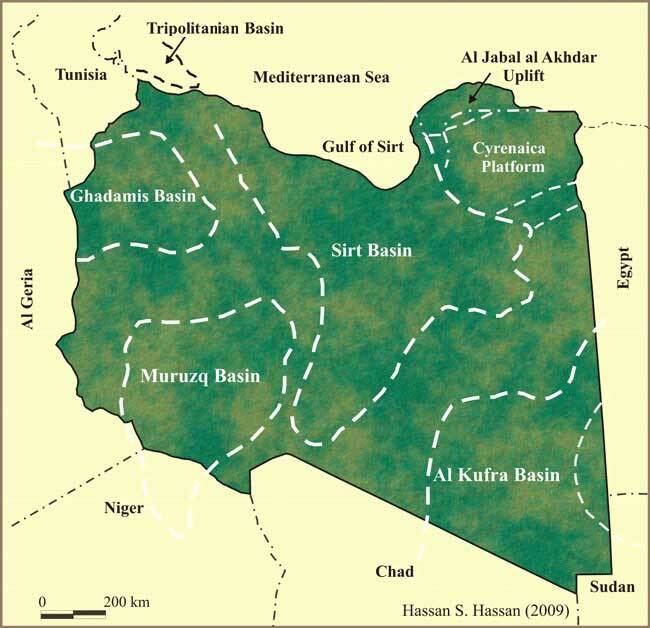 The intraCratonic sag of Al Kufrah Basin is oriented northeast-southwest and located in south eastern Libya, it is the third largest Libyan sedimentary basin, reaching about 400,000 km and has structural elements of varying ages and trends. The overall geological setting of this basin is similar to that of the Muruzq Basin ; both basins overlie basement rocks, are intraCratonic, and composed dominantly of clastic sediments. An up to 8350 m thick sedimentary section of Paleozoic is composed largely of marine sediments that were deposited in the sedimentary basins and sub-basins of north Africa. The present day geometry of the Al Kufrah basin appears to be principally the result of the Hercynian tectonics. Due to the lack of seismic exploration data is little known about the subsurface geology and the sequence stratigraphy is poorly understood. However fortunately, many economically important horizons, which include the Tanzuft shale source rock from the subsurface, can be studied in greater detail in surface exposures. No commercial discoveries have been made to this date but hopes remain high. Certainly Libya has seen the entry of several American companies with an interest in the Al Kufrah Basin over the past two years. Many authors have agreed that this basin has great similarities with Muruzq Basin that include tectonic history and stratigraphic nomenclature. The lower Silurian Tanezzuft Shale and the Upper Ordovician sandstone of the Mamuniyat Formation may represent the best possible petroleum system in the Al Kufrah Basin; especially it is considered a commercial target in the neighboring Murzuq Basin. The Infracambrian (Neoproterozoic to Early Cambrian) petroleum geology of North Africa and the Middle East is now just beginning to be understood especially following the occurrence of proven plays in Oman and Mauritania. Luning et al. (1999), suggested that the Infracambrian graben as well as Infracambrian sediments have black shales or organic-rich Limestones that are potential source rock, and this suggests the possibility of an Infracambrian play with the sandstones or fractured Limestones as potential reservoirs (See figure below). Stratigraphic section of southern and eastern basins of Libya; Paleozoic correlation chart between different basins in Libya. Note the distribution of reservoir and source rocks.